Front Street Shipyard plans to use the machine to cut carbon fiber panels for commercial ferry construction. The US Department of Transportation has reportedly awarded over US$660,000 to composite boat maker Front Street Shipyard. 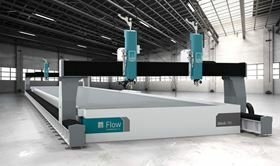 The company says that it plans to use the funds toward a purchase of a Flow Mach 700 Waterjet Cutting Machine. The equipment is designed to help streamline the construction of custom and production vessels and will be the largest of its kind in the state of Maine. Front Street Shipyard plans to use the machine to cut very large parts such as wooden frames for recreational boat molds and carbon fiber panels for commercial ferry construction. Shipwrights will cut parts directly from electronic data drawn by engineers. ‘With a machine of this size and capability we hope to attract diverse projects, including non-marine applications,’ said JB Turner, president. Front Street Shipyard will begin installation and operation of the waterjet cutting machine early this in winter 2018. This story is reprinted from material from Front Street Shipyard, with editorial changes made by Materials Today. The views expressed in this article do not necessarily represent those of Elsevier. Japanese ceramics specialist Kyocera plans to introduces a range of cutting tools at this year´s AMB metalworking trade fair in Stuttgart, Germany. Carbide specialist Ceratizit has published a four-page report, written by Dr Uwe Schleinkofer, head of R&D at the company. Gunnar AG has formed a partnership with Germany-based Robuso, which supplies a range of manual, electro and air powered shears and scissors.